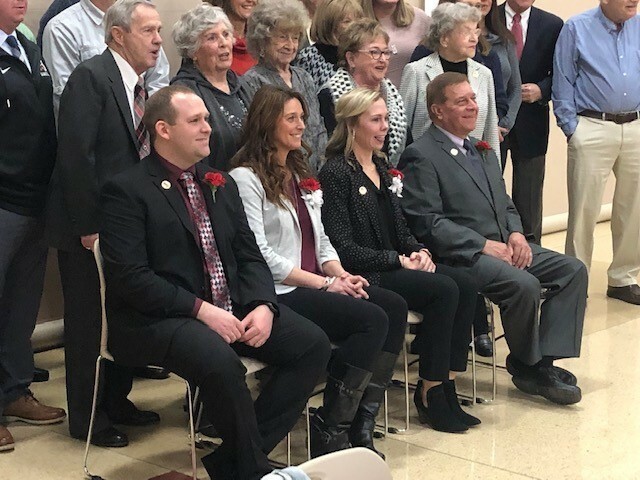 Congratulations to the newest members of the Milton-Union High School Athletic Hall of Fame inducted during the annual ceremony on Saturday, January 26, 2019. The event was well-attended by family members, friends, community supporters, former graduates, school staff members, and prior Hall of Fame inductees. Mark Vagedes (Class of 1967), Jessica Herkins Brumbaugh (Class of 1995), Jenn Wright Scherpenberg (Class of 2000), and Ryan Paul (Class of 2005) were recognized as the Milton-Union High School Athletic Hall of Fame Induction Class of 2018. Highlights of the annual event often include remarks made by honorees in delivering acceptance speeches, and certainly, members of the Class of 2018 were equally inspiring. Stories were shared of incredible sacrifice, resiliency, goal-setting, and the significance of commitment and work ethic in making dreams become reality. The inductees were all complimentary and deeply thankful for support they received from family members, friends, teammates, coaches, and school employees in providing the foundation for lifetime success. Sincerest thanks to Dr. William Ginn who emceed the event and all members of the Athletic Hall of Fame Committee for showcasing the Milton-Union Schools and providing this year's honorees with an opportunity for another very special memory within already prestigious athletic and professional careers. The ceremony showcased some of the very best parts of the Milton-Union traditions. "Once a Bulldog, always a Bulldog..."